Setting up an intranet may not be exciting. But saving time using built-in tools to set up an intranet, getting home on time, and actually getting to take that vacation to Lake Tahoe you’ve been planning… that’s pretty good. SharePoint 2016 offers a suite of features that can be used to build a robust company intranet right out of the box. 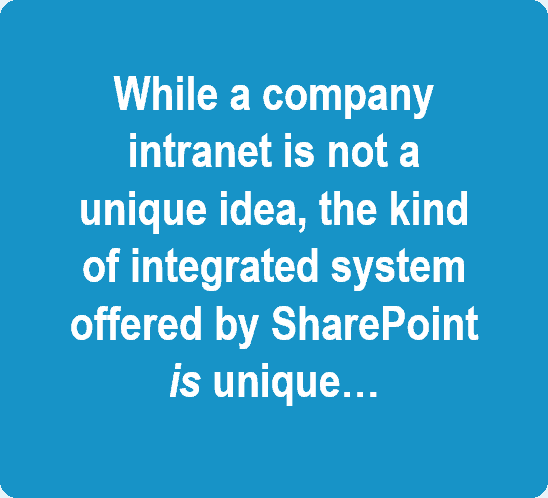 While a company intranet is not a unique idea, the kind of integrated system offered by SharePoint is unique in a variety of ways. For one thing, it’s easy to implement with tools already included in SharePoint. Also, it can be up and running in a matter of hours, depending on how large the company is and how much customization you want to do. It’s also partitioned in customizable ways that allow you to personalize the SharePoint experience for every project, team, department, and function. You can differentiate the structure by department and project to facilitate the most efficient and effective work modality. This level of customized integration is perfect for IT companies handling multiple and varied tasks on a regular basis. There are six major features of SharePoint intranet that make it the powerful project management tool that it is today. These six features include the following items. Let’s take a look at what a typical company setup tends to consist of and the challenges that such a setup poses to the IT professional. Then, we’ll look at each of the major SharePoint features and discuss the benefits of each. Nearly everyone working in an IT environment has some form of intranet already. Most companies do. However, if an intranet already exists, it’s usually run on a third-party site. Alternatively, you might be using an external software program or SaaS platform. Regardless, you’re relying on third-party services to facilitate the intranet most of the time. External sharing is probably conducted by way of an often-glitchy cloud program like Dropbox. HR onboarding, employee scheduling and time cards, and other administrative tasks rely on manual processes and paper or PDF forms. It’s also pr obable that most CRM functions exist within and are facilitated by Excel or a similar spreadsheet app. This spreadsheet might be centrally located so that multiple people can access it, but it’s probably difficult to access and requires several steps in order to find and update the information therein. Similarly, your employee directories, client lists, and other contacts are probably stored within an Excel-like program. Another feature of the typical office environment is having to conduct file sharing via network drives within a corporate firewall. And even after all of that, we still haven’t touched on project management, which is probably conducted through yet another third-party SaaS platform or software program. That’s an exhausting list of multiple functionalities that need to be coordinated and handled in a collaborative environment. However, these functions tend to exist in unrelated and disintegrated programs and services that don’t talk to each other and aren’t functioning as a single unit. Having all of your necessary services, files, documents, and other resources scattered across multiple, external, third-party platforms and programs makes it extremely difficult to collaborate on anything. Getting work done becomes a slow and arduous process that requires multiple phone calls, requests, emails, and points of contact before everyone has what they need. Not only does this hamper efficiency, the lack of collaboration and centrally located information opens you up to a greater possibility of error, lower accuracy, and even a lower-quality service or product. What’s more, most of these external services cost money, and once you start adding up all the monthly and annual fees it ends up being very costly to run multiple programs. SharePoint can help you avoid all these problems by facilitating a collaborative work environment hosted in-house on a single intranet. Versioning is one of the most powerful tools SharePoint has to offer. When you enable versioning, you never have to worry about overwriting a document because every version of that document is always available in the version history. If you’ve ever hit “save” instead of “save as” when working in a master template or accidentally overridden a master form, you know the panic that such an action can cause. Versioning removes that panic entirely because even if you do make a mistake, you can simply go to the version history, pull up the version you need, and keep working. Document versioning within the SharePoint intranet also allows you to audit the entire history of any item. This can help you improve workflow and analyze what you can do differently in the future. It also allows individual users to recover their version of a document because a record of who created each version exists within the version history. In other words, if one of your technicians needed to know what she did on a certain project or wanted to pull up her edits on a document, even if edits have been made after she completed her version, hers will still be intact and easily accessible. Another often overlooked benefit of document versioning is the ability to track all the metadata changes throughout a document’s history. You can also compare versions and take what you like from each version to create a hybrid document that combines the best of everyone’s edits and ideas. These operations can be automated with SharePoint workflows. Aside from versioning, another great benefit that relates to document management is being able to update documents in real time. In other words, instead of having to send documents manually or email an update to your team members when something changes or is added to a project, you can simply upload the document into the project site and everyone will have access to it immediately. Changes to documents can also be seen in real time. This helps everyone stay on the same page and mitigates the risk of miscommunication. Another great feature that SharePoint has to offer IT companies is the ability to create department sites right on SharePoint intranet. You don’t have to dump all your data into a giant corporate site with a thousand tabs and send complex links to employees who need to access department-specific information. Instead, you can create a department site for each department in your company. These sites are easily accessible from the main intranet via the “Departments” drop-down. Simply upload the information and sections you need into each department and your employees are ready to go. Department sites allow your employees to access department-specific policies, commonly used forms, training material, time cards, benefits information, a department calendar, a department and corporate directory, various projects, wikis, and even a list of commonly used external links. You can upload instructional videos, as well, and facilitate an integrated departmental workspace that’s even capable of hosting virtual meetings. Similar to the department sites, SharePoint intranet also allows you to build project sites. Each project site contains the documents and information that team members working on a certain project need. You only need to add the team members who are working on a particular project to that project site. This keeps everyone’s dashboard clutter-free and focused on the essential tasks they need to complete their project or projects. Another benefit is that managers can access all the projects from a single drop-down on SharePoint intranet’s home page and manage all project-related activities from a single location. You can share feedback, use the discussion board, provide real-time notifications and project changes, add documents, view old versions of various files, hold informal virtual meetings, and collaborate no matter where you are. Project sites help keep you organized and on track and minimize the risk of human error, miscommunication, and the general lack of cohesion that exists when project team members are forced to navigate through various independent programs in order to get things done. They help project teams work effectively and collaboratively to reach the best possible end product or solution in the shortest amount of time. Even IT companies have a help desk, and SharePoint has a solution for that, as well. Miscommunication can be a huge problem when handling tickets and open issues in a large IT support department. A recent study found that 46% of people surveyed feel that miscommunication is most likely to happen in electronic communication (email, text, phone, and instant messaging). Fortunately, SharePoint intranet has a built-in, out-of-the-box IT help desk that clearly displays open issues, iterations and updates, ownership tracking, and versioning, just like the documents and files in project sites and other areas of SharePoint intranet. What’s particularly helpful about an IT help desk with versioning is that you can go through and find common ticket types. If the same types of tickets are generally approached with the same set of steps, you can start to compile a self-help reference section for employees who are struggling with a common issue. Instead of bogging down the IT help desk, they can follow the steps and fix simple, common problems on their own. This frees up IT support to handle larger, more complex, and urgent tickets. Also included in SharePoint intranet is the ability to track sales and display pertinent information in a sleek format that’s easy to navigate. Members of your sales team can find important information quickly and easily. What’s more, sales team members can generate specific, customized reports and print them for their own records. This can help each individual sales representative obtain crucial data about their own performance and overall company performance, which can help them improve faster. You can easily integrate Excel worksheets from Microsoft365, merging them seamlessly into the Sales Tracking interface. The rough data within the Excel spreadsheets is translated into a beautiful, easy-to-navigate display with customizable views and analytics information that all sales representatives, managers, and employees can view and learn from. If hearing the term “wiki” makes you think Wikipedia, you’re on the right track. Wikipedia is a virtual encyclopedia where people from all over the world can contribute their knowledge to build a megalithic volume of data that everyone can learn from. It’s the product of a global hive mind. Similarly, your SharePoint intranet’s wiki is a place where resources, references, documents, data, links, and anything else that contributes to your corporate resource library can go. Each individual project can have its very own wiki, as well, which allows project team members to access templates, reference materials, forms, examples, specifications, task lists, reference material, applicable articles and data, and anything else related to the project that team members might need to reference on a regular basis. Having corporate, departmental, and project-specific wikis allows you and your employees to access the same set of ever-growing data so that everyone can learn and grow together. What’s even better is that you can create self-directed training programs, upload them to the appropriate wiki, and obtain proof of completion via tests and quizzes that you can upload, as well. This saves you time and money because you won’t have to create formal, in-person trainings as often as you might have to without the convenience of SharePoint intranet’s wiki. Cleary, SharePoint has much to offer IT companies and firms. Right out of the box you can implement and customize your SharePoint intranet, uploading any data you need and creating an integrated, functional hub where everyone can work together and share information effortlessly — and in real time. The sections of SharePoint intranet discussed above are listed like pages on a website, so you can easily access the area of intranet that you need without any hassle. Department sites are listed under the department dropdown, project sites are listed under the project drop-down, and directories can be listed under the contacts tab. It’s that easy. You can customize SharePoint intranet, as well, so your corporate site does what you need it to do and provides your employees with the collaborative space and functions they need to do their jobs effectively and accurately.